(Nanowerk News) A surprising phenomenon has been found in metal nanoparticles: They appear, from the outside, to be liquid droplets, wobbling and readily changing shape, while their interiors retain a perfectly stable crystal configuration. The results, published in the journal Nature Materials ("Liquid-like pseudoelasticity of sub-10-nm crystalline silver particles"), come from a combination of laboratory analysis and computer modeling, by an international team that included researchers in China, Japan, and Pittsburgh, as well as at MIT. Silver has a relatively high melting point — 962 degrees Celsius, or 1763 degrees Fahrenheit — so observation of any liquidlike behavior in its nanoparticles was "quite unexpected," Li says. Hints of the new phenomenon had been seen in earlier work with tin, which has a much lower melting point, he says. 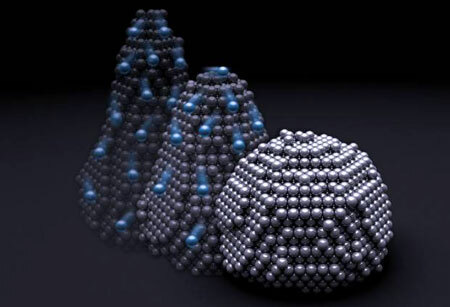 The researchers' detailed imaging with a transmission electron microscope and atomistic modeling revealed that while the exterior of the metal nanoparticles appears to move like a liquid, only the outermost layers — one or two atoms thick — actually move at any given time. As these outer layers of atoms move across the surface and redeposit elsewhere, they give the impression of much greater movement — but inside each particle, the atoms stay perfectly lined up, like bricks in a wall. Technically, the particles' deformation is pseudoelastic, meaning that the material returns to its original shape after the stresses are removed — like a squeezed rubber ball — as opposed to plasticity, as in a deformable lump of clay that retains a new shape. That crossover, he says, takes place at about 10 nanometers at room temperature — a size that microchip manufacturers are approaching as circuits shrink. When this threshold is reached, Li says, it causes "a very precipitous drop" in a nanocomponent's strength.